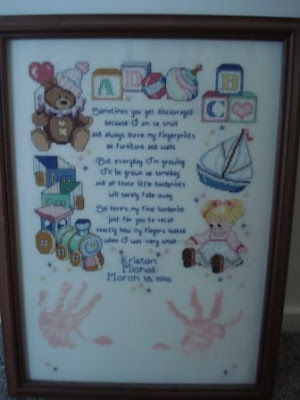 This was my first large cross stitch I done when my daughter was a baby. She is now nearly 14 years old, so it has been a while. I thought I would never finish this. When I bought the kit for the Baby Keepsakes I was adventerous and also bought Farming The Land kit as well from the Fox Collection . Unfortunately I have never seen it since for sale. This is one of the patterns I completed. 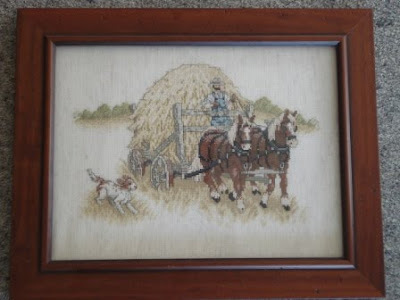 When doing this one I had done half the hay when I realised I was stitching portait instead of landscape and had to unpick it all and start again. I have never done that again! !